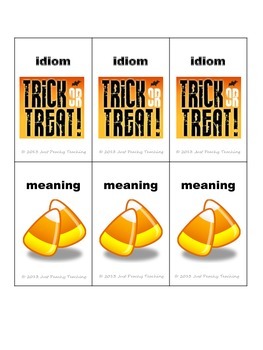 Idiom Concentration is an engaging literacy center in which students learn and practice common idioms. This activity keeps students learning during the exciting Halloween season. 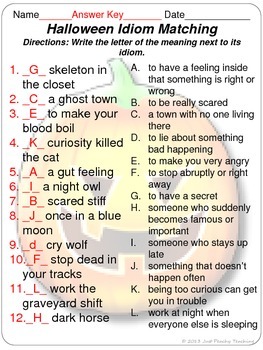 Students learn common idioms with a Halloween twist, including a ghost town, scared stiff, and makes my blood boil. 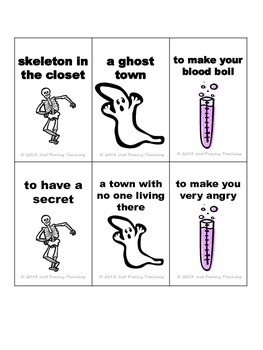 Graphics include candy corn, Frankenstein, ghosts, and pumpkins which will keep your students entertained. This concentration style game has matching pictures making it a self-checking center. Please see the detailed preview for more information. Thank you for your interest in this product. 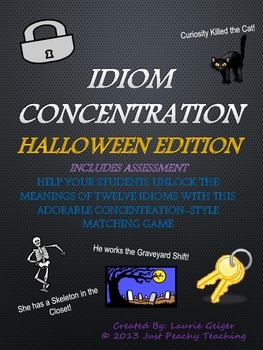 Be sure to check out my other Idiom Concentration Games.